S M Ong: Local celebrity babes marrying foreign Caucasians: I support you, sisters! Local celebrity babes marrying foreign Caucasians: I support you, sisters! In the 1995 book Revenge Of The Sarong Party Girl, sequel to The Official Guide To The Sarong Party Girl, I was listed as No 4 among “Local Desirable Men”. The top three were entertainer Najip Ali, footballer Fandi Ahmad and TV host Bernard Lo, who’s now with Bloomberg. I managed to beat Mr Johnson Lock, famous for his roast duck, who came in at No 5 (the man, not the duck). So as you can see, I have no reason to feel insecure that all these local celebrity babes are eschewing local men and hooking up with foreign Caucasians. On the contrary, I applaud these women’s excellent taste. Joanne Peh is dating Singapore-based US actor Bobby Tonelli while Jamie Yeo is seeing Englishman Thorsten Nolte. Sharon Au is engaged to a French guy while celebrity blogger Xiaxue is getting hitched to US engineer Mike Sayre. Vernetta Lopez married an angmoh last year. It would be hypocritical of me to criticise them (Pinkerton Syndrome, anyone?) since I too have eschewed local men and hooked up with a foreign Caucasian. 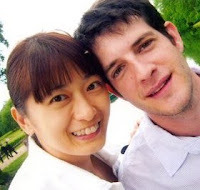 Like Carole Lin, my marriage to a white person lasted about a year. Unlike Carole, who married a Frenchman, I married a French Canadian-Irish American. I did so because my Hainanese mother forbade me to a marry a Khek. Her reason: Hainanese and Khek don’t mix. Huh? Whatever. But since I can’t identify Kheks by sight, I decided to avoid marrying all Chinese people just to be safe. Perhaps these celebrity babes also have Hainanese mothers. The question is not why so many local female celebrities are marrying Caucasian men. The question should be why not more local male celebrities are marrying Caucasian women. Is Adrian Pang the only one? Unfortunately, my own marriage to a Caucasian woman failed, so I decided to give Chinese people a shot. My present wife is Hokkien. But, honestly, for the rest of you ladies, if you can’t get any of the top five “Local Desirable Men”, don’t bother with the rest of the local guys. As the Government has reminded us time and again, to succeed, Singapore needs foreign talent – both male and female. Roast duck can get you only so far. UPDATE: Carole Lin: Third marriage's the charm?